Posted on Sat, Feb 11, 2012 : 12:06 a.m. The Master Gardener Talks Series at Nicola’s Books continues on Monday, Feb. 13 with a presentation on Raised Bed Construction and Gardening. The talk begins at 6 p.m. at Nicola's Books at 2513 Jackson Road in Ann Arbor. Raised beds have many advantages over traditional garden beds. Their soil tends to warm earlier in the season, allowing for earlier planting. 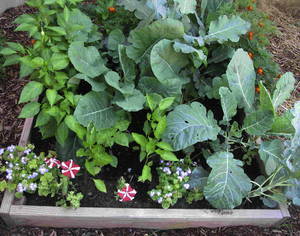 Raised beds tend to have better drainage, which many plants appreciate. The placement and design of raised beds allow for easy access from the paths so the soil does not get compacted. Additionally, gardeners have more control over the soil in raised beds because they can 'build it up' with compost and organic matter as they construct the bed. After they are built, raised beds provide low maintenance gardening. Building a raised bed is a not-too-difficult project that can quickly increase the size and quality of the growing space in a garden. This workshop will provide tips and ideas for constructing raised beds for your garden. The talks are led by members of the Master Gardener Alumni Association of Washtenaw County. Master Gardeners are enthusiastic gardeners/volunteers trained by the Extension Service in horticultural information and research-based gardening methods. For more information about the local MSU Extension program, see their website. This lively and informative discussion will inspire the home gardener to expand and deepen his or her gardening knowledge — and gardening plots.